“Is this the way to Clifton Village?” is a request that many of us will have heard asked by visitors from home and abroad. In order to help, Clifton BID (Business Improvement District) proposed to erect up to half a dozen, noticeboards with a map of the area, all strategically placed at points of arrival around the “Village” as it’s been called for thirty years or so. CHIS received the idea warmly and was glad to help with some improvements to the map and ideas for positioning. Planning permission is being sought. So too for Bristol University’s wish to put signs outside the Victoria Rooms. In that case we are strongly objecting to their quality and positioning. A major reason for Clifton’s attraction is that it is a Conservation Area. CHIS was set up first to fight the further dire Sixties degradation of the place (an eight-storey hotel tower below the Suspension Bridge). Alas, although much greater architectural care was thereafter taken, there is a feel of the Sixties Return as Bristol City Council planners no longer insist on the highest standard firmly enough to counter relentless pressure by developers who prolong applications in a potentially expensive way. There are two considerable threats at present: the WH Smith site (where we hope Bristol City Council will stick to its hitherto duty) and Somerset House in Canynge Road. Details can be seen later in this Newsletter. If the Sixties are back with us, the proposed noticeboards may not be needed: who wants to tour that kind of architecture? Improvement was from our foundation a major aim, which we try practically as well as philosophically to fulfil. The latest instance is the restoration of iron railings at St Vincent’s Rocks Garden opposite the Avon Gorge Hotel, which we have helped to fund. Mortimer House is at last being internally restored. Behind the high temporary wooden fences as a garden which we are assured will be stylishly re-instated. Wouldn’t grand iron railings be a gracious finish? Linda Edwards, RoseMary Musgrave and I were invited by Bristol University to attend a meeting to learn about their proposals to close Tyndall Park Avenue and have it as a pedestrian area. As yet no planning application has been made but doubts about the scheme were raised by those attending, in particular with regard to the bus route alteration and the loss of parking. CHIS anticipated the welcome Spring Season with the lunch on March 11th in the Apostle Room: home-cooked courses of a deliciously high standard were again provided by the CHIS BAKE OFF team of Linda Edwards, Olwen Laszlo, RoseMary Musgrave and Jenny Sparkes. So much hard work was carried off with such lightness and calm, as was the CHIS-QUIZ, served as a digestif and the results an aperitif. Spring has made St Andrew’s Churchyard a joy. Summer will for the third time by heralded by the Green Squares and Secret Gardens weekend, June 10th and 11th. Arrangements will again have been extended and perfected by RoseMary Musgrave, Liz Golding and Jenny Sparkes; the only reservation is that they can’t guarantee the weather. Members braved the Winter evening to hear our January talk by Dr Bryan Carroll on one of Clifton’s crown jewels, Bristol Zoo, of which he is the Director. He described what is the oldest zoo outside a capital city, from its far-sighted founders to the notable educational and conservation establishment of today. He expressed private relief at not being challenged about the thorny topic of Zoo visitors parking in summer on the Downs: we would never have been so graceless a host. Those who looked forward to an entertaining account of the life of the Reverend David Doudney, incumbent of St Luke’s Church in Bedminster from 1859-90 were to be disappointed. Dr Martin Crossley-Evans’s lecture was prevented by his ill-health. Another date is planned. In place of it, an in-house trio held the fort. 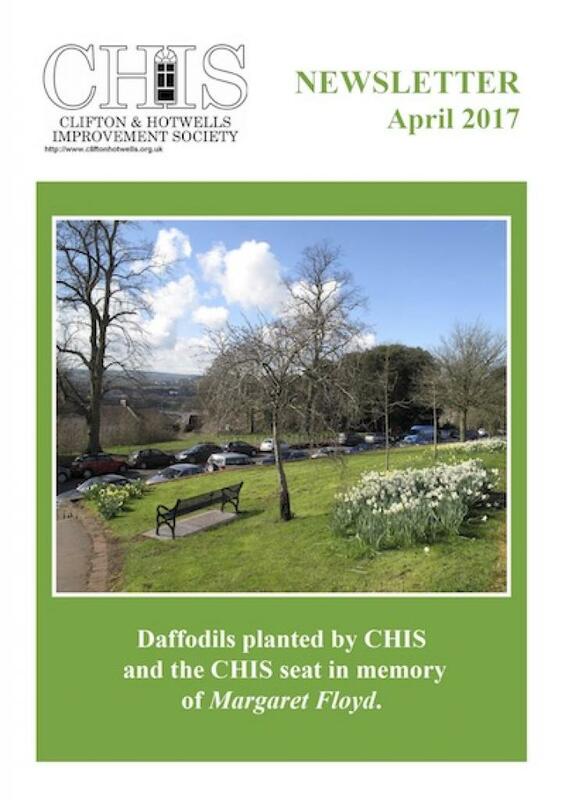 Maggie Shapland, RoseMary Musgrave and I had in 2016 lectured to the Gordano Society on the history and achievements of the Clifton and Hotwells Improvement Society. We dug out the script and power point presentation, rehearsed briskly and went ahead. Members said they had learnt or been reminded of a great deal about our 49 years – as had we! The fiftieth year looms, with suitable activities to be decided. On April 25th Gordon Young makes a welcome return, presenting his films, possibly the award-winning “Bristol Revisited” and/or the new Bristol from A-Z. The Mayor’s city wide determination is to deal with pervasive litter. If only he will included Alma VILE Road. There were hints that the new owner of the Avon Gorge Hotel will take steps to rescue the Spa Pump Room, so appallingly neglected, but all has gone quiet. Our next plaque is dedicated to the notable car engineer Jem Marsh on Saturday 6th March at 11.00 at 1 Carleton Mansions, Richmond Park Road. Finally, congratulations to Maggie Shapland upon being awarded the Lord Mayor’s Medal for her many services to the community. She is the fourth member of the CHIS committee to be so recognized.